I am taking a chance as I offer this in jest, especially since I have very good friends who enjoy Scoresby and I most certainly do NOT want to offend them. Normally, I would never necessarily hassle anyone about their preferred beverage. And yet, my integrity is at stake if I falter. With that being said, much work is necessary to prepare the reader for the actual review. I’m sorry if after you begin reading, you feel as though you can’t go on. Please, be encouraged to continue. “It’s all relative.” Well, yes and no. Lend me your ear and give me a moment to explain. Now consider it this way. What if you consider this statement on relativity to be all-encompassing? Before going any further, simply by taking such a stance, you have already asserted belief in an absolute truth–that everything is relative. This alone proves your theory dead that there is no such thing as universal truth. But even if we miss that point, let’s say that you teach the philosophy to your child, your son. And then one day, he comes to you and tells you that he is going to kill someone, that he has made a conscious decision to do so because it feels right. You tell him, “You can’t do that! That’s wrong!” His response, “No, it’s not. Everything is relative. It may be wrong for you, but its right for me.” According to the philosophy to which you have already subscribed (and taught to the child), you have no standing because of this supposed universal “truth” that everything is relative. Now let’s think of it a different way… And perhaps this will draw us a little closer to an actual review of Scoresby. “It’s all relative” is accurate insofar as we acknowledge that there are objective truths to which relativity may be measured. Considering the previous example: Objectively, killing someone is wrong, and this rule has been put into place as foundational to our very existence. Christians know its origin, and the world obviously has “natural revelation” working towards its benefit, in place so that it serves as God’s instrument to practice and enforce it. No matter how the truth is known, it is there and it is an all-encompassing, unalterable truth no matter what anyone believes otherwise. But is killing someone always wrong, say, when it comes to self-defense? The rule remains, but the subjective rears and shows its relation to the objective. In that sense, it is relative, especially if someone has every intention of killing you and you fight back resulting in the attacker’s death. Killing is wrong, but in this case, perhaps justified and necessary for preserving the ultimate objective truth which says that killing is wrong. Considering another angle: The objective truth is that the world is round, and yet there are those who are members of the Flat Earth Society who still believe it is flat. In the end, no matter what the subjective opinions or philosophies may be, the world is round. How precisely “round” the world is, well, perhaps that’s relative. In summary, therefore, we conclude that there are objective truths–definable “good” and definable “evil”– and there are subjective truths, but the subjective truths must be in submission to the objective truths. For example, water may be acceptable as “good,” but within that particular category, it must be understood that some waters must be avoided because they are “bad.” A crystal clear, untainted glass of water is “good” for drinking. Sewage water is not. A swimming pool is nice [now arguably employing slight levels of “bad” in the midst of the “good” (i.e., unsupervised children in a pool can be bad)], but a portion of ocean used as a nesting ground for sharks, relative to a swimming pool, is something to be avoided, not because the water is bad, but because what comprises the purpose of the water and its present condition is definably bad. Relatively speaking, it would not be bad for someone who comes to the nesting area in order to study the sharks, though the higher levels of objective truth still nudge the senses to realize that there are dangers present. The scale of subjective “bad-better-good” remains under the objective truth. It is by this philosophy (with tongue firmly planted in my cheek) that I’d prefer to review Scoresby. Enjoy… and I hope that we remain friends at the conclusion. And because I am a Scotch snob, the fuller review follows with such vividly hysteria-driving description only because I know that it will be a good payback for the jabs I get from particular friends (who, by the way, I love, adore, admire, and hold in high regard). Again, normally, I would never necessarily hassle anyone about their preferred beverage. Sitting in the dining room of one of the previously mentioned friend’s home (as the picture relays), I nosed, sipped, and savored a bit of Scoresby, and then I put pen to paper to jot a few notes. Nose: When it comes to floor paints, Scoresby is well above the lesser Glidden and just below the higher quality Behr. It does have a long way to go to reach the caliber of Sherwin Williams. But relatively speaking, this was my first thought, and it only applies to floor paints. It could be different if I’d been thinking of waterproofing or indoor wall coverings. Palate: This was tough. My synapses fired forth images from the “Animal Kingdom” portion of my brain, that section that helps me say “Run for your lives, it’s a lion!” when a lion is near. Savoring (not gulping, but actually swishing), Scoresby must be very close to whatever fluids are used by animals to mark their territory. Even further, I’d say that Scoresby was sprayed by a pregnant female in that it offers the contours of a spray enhanced by hormone increases. Finish: Long-lasting and enjoyable, like a migraine combined with the difficulty of trying to run away from that lion while one of your principle limbs has fallen asleep, except this time, it’s not just your leg, but your face, too. In conclusion, as I said throughout this jest, Scoresby is by definition “good,” but maybe give a try to some of the other Scotches I have reviewed in this blog so that you can experience the swimming pool. Even better, take time to experiment. For example, purchase a bottle of Clan Macgregor ($8), a bottle of Scoresby ($12), and then jump a reasonable distance up the scale to a bottle of Glenfiddich Solera Reserve 15-year ($50 in most stores and not all that out of reach for the average consumer). Set them side-by-side and smell the bottles. Start with Clan Macgregor. Take a sniff and then do it again. Now sniff the Scoresby. Sniff the Clan Macgregor again. 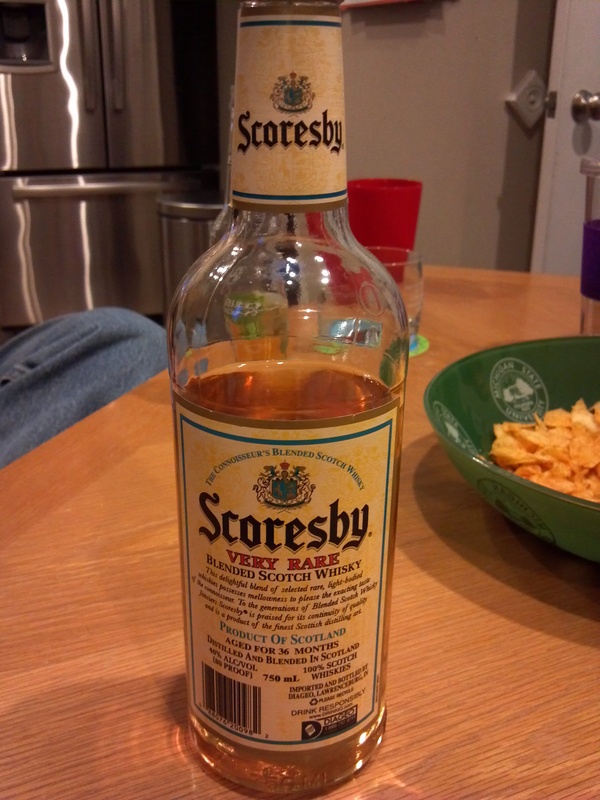 Relatively speaking, Scoresby will be noticeably sweeter. Now, jump way up the scale. Smell the Scoresby. Nice, right? Do it again to get the smell in your brain. Now smell the Glenfiddich. Can you tell the difference? Relatively speaking, the one you knew before as “sweeter” is now burning your nose. It is extremely unpleasant in comparison. The Glenfiddich, it is markedly better, a scent of chocolate. Now smell the Scoresby again. See what I mean? So with that, do the same for the palate and finish. Swish the contents individually in the drams and then in the mouth. Consider the flavors of the finish after you’ve swallowed. Now, what is truth? Is there such a thing as good Scotch and bad Scotch? Brothers and sisters, you will know the truth, and the truth will set you free. Wow! Aged 36 months …and here I thought I’d spotted a typo. In fact, since you identified the Glenmorangie, I’m confident you weren’t offended. That is correct. Right now we are working on Glenmorangie “Astar.” Quite enjoyable. Very nice. Soon, I shall review it. Scoresby came out on top by a wide margin!!! So I suggest you might consider a more objective approach in evaluating scotches, but I do respect your input and enjoy your Scoresby “trash talk” as I savor it by the campfire. Thanks for the comment, and thanks for taking the time to read what is a rather lengthy jest. I’m glad our paths have crossed. I might offer that perhaps you could share the names of the other whiskies you tried. Not all supposed “top tier” whiskies deserve their place. I jokingly refer to myself as a scotch snob. I assume that you are using the term with the same geist. For certainty with regard to my self-directed jesting, I would encourage you to traverse the larger expanse of this blog. You would find that I have given a few “low end” whiskies some very high marks. For example, check out my review of Black Bottle as well as my review of Tomatin 12. Both inexpensive whiskies. Additionally, I would humbly ask you to consider with regard to being “scientific” that my taste-testing happens in more of a “clean room” setting than what you appear to be enjoying. I am not reviewing scotches after having paddled down a river covered in the musk of the day while sitting near a campfire. I would drink a scotch after having done this, but not necessarily review one. As you most likely know already from science, there are many and various tiny elementals hovering through and into the nose with every inhalation. Your setting would be one with certain amplifications at play. They will, most certainly, join hands with the whisky scent if given the opportunity. Hardly clean, and by no means scientific. Now, the collection of the data, that was scientific, but what use is the data with a corrupted sampling? Lastly, a blind taste test for those who have (over the course of several years) been comforted by Scoresby as a familiar friend, well, you know the proverbial prattling about familiarity and likeability. Maybe try the camping/canoeing trip with a different whisky for a few years and then do the test again. I wonder if the results would be the same. Thanks again for taking the time to comment. I enjoyed reading of your study. Nevertheless, objective truth remains. If you’d like, I will join you for one of your trips and bring along the goods that I’m certain will convince you. Cheers and slàinte! Wonderful! Sounds like we are kindred spirits. I’ll be watching the news feeds! Keep in touch and visit again soon! How can you even compare a single malt to a blended Scotch Whiskey? I really do not understand?? ?